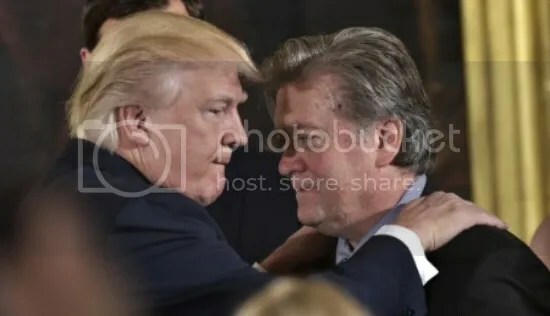 President Trump and Steve Bannon (Mandel Ngan/Getty Images). See this article published in International Policy Digest and Politics Means Politics Magazine. After leaving the White House, Bannon declared the Trump presidency to be “over”, not meaning that Trump lacked legitimacy, but rather that Bannon intended to rally the president’s base to accomplish the administration’s policy goals. 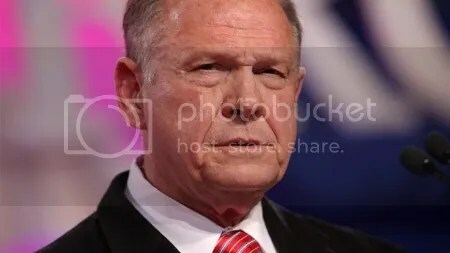 Alabama Senate candidate Roy Moore. (Greg Nash). The first metric to consider is the progress Trump has made with border security. Throughout his campaign, and in the early months of his administration, Trump argued for a new border wall with Mexico and a travel ban. This played directly to his supporters’ sense of xenophobia, but also legitimate concerns over who gains access to our homeland. 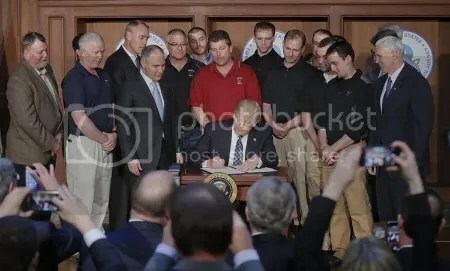 President Trump signs the “Energy Independence” order surrounded by coal miners at the EPA. (Pablo Martinez Monsivais/AP). While such a statement undoubtedly created supporters in areas like the Rust Belt, Trump has little chance of following through with his promises to the mining community. Over the past decade, coal power generation has dropped as natural gas prices have declined, offering power companies a cheaper and more clean energy alternative. This leaves Trump in a fight with the free market, a battle he cannot win. In turn, coal miners, and likely much of the white working demographic, will be disappointed as Trump is unable to revive industries that have been felled by modernization. This is unfortunate for Bannon, who has harnessed the white working class’ allegiance to Trump and used it to fuel his rebellion against the GOP. But if Trump is unsuccessful, then in a few years we might not even remember the guy who once called himself “Bannon the Barbarian”.